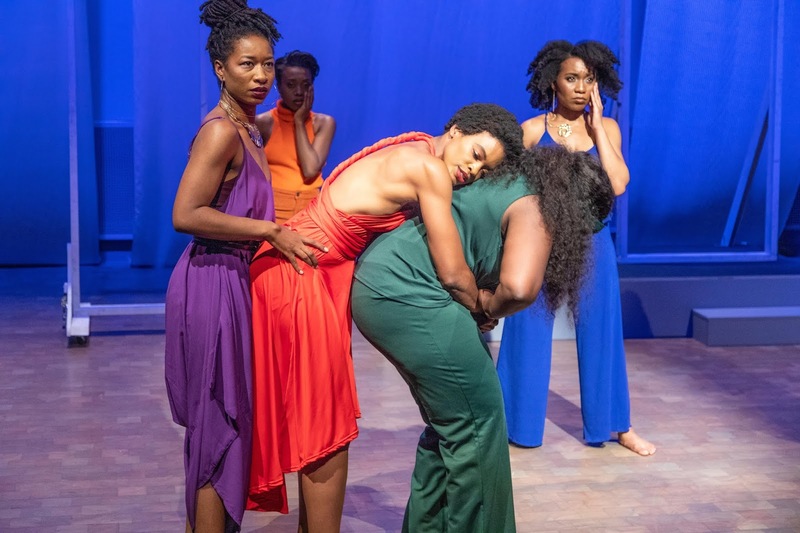 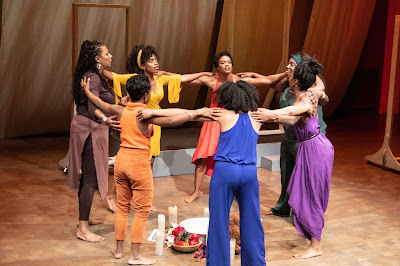 Ntozake Shange’s 1975 choreopoem For Colored Girls Who Have Considered Suicide When the Rainbow is Enuf lives again in a remarkable new production directed by Elizabeth Carter that bursts, vibrates and sings its stories of loss, joy, pain, strength and most of all, resilience. 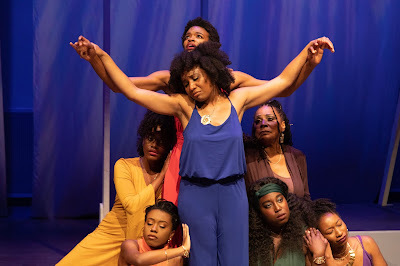 Seven unique characters are simply named “Lady in Brown” (Jan Hunter), “Lady in Yellow” (Tiffany Tenille), "Lady in Purple" (Bobbi Kindred), "Lady in Red" (Paige Mayes), "Lady in Green" (Brittany Nicole Sims), "Lady in Blue" (Natasha LaGrone), and "Lady in Orange" (Regina Monique). 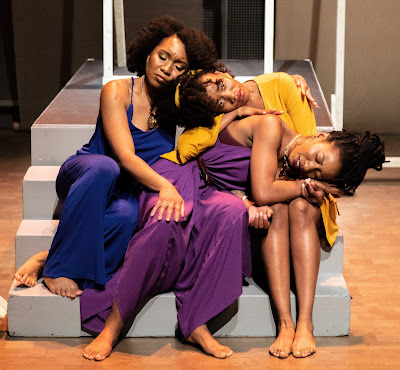 Each speaks the rich and musical monologue that is their story, each voice a thread that interweaves with the others to create a strong fabric of power and pride. 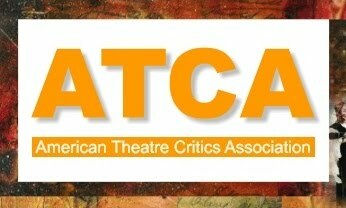 This is a simple, elegant production in the newly restored Taube Atrium Theater, and the creative collaboration of the all-female cast and production crew is evident. 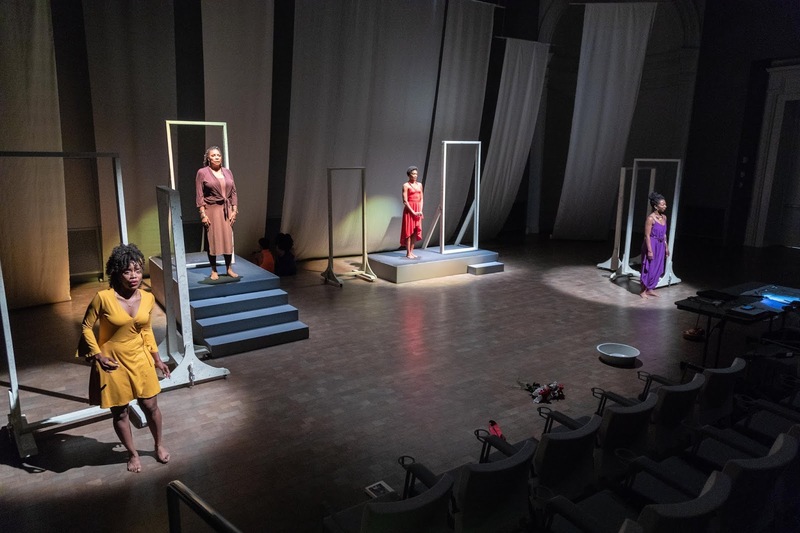 The lighting design by Stephanie Anne Johnson subtly suggests a cityscape, and the set design (Randy Wong-Westbrooke) uses moveable frames for each Lady to act as portals, cages, islands, and personal stages for the stories. 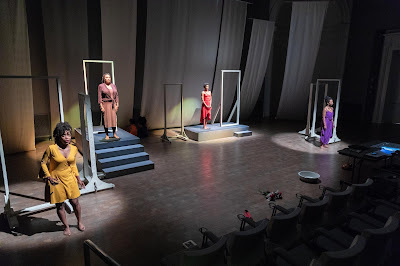 The minimal set suggests that it is the stories that endure, despite the time and place. Choreographer Kendra Kimbrough Barnes taps into the rhythm of emotion that informs this play, adding depth to the stories. 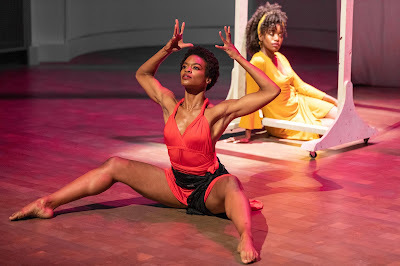 Especially beautiful are the sensual and flowing dances by Lady in Red (Paige Mayes) and Lady in Yellow (Tiffany Tenille). Although created in the 70s, For Colored Girls... remains a classic celebration of the hearts and souls of black women--and all women---as they struggle to find and celebrate their voice.